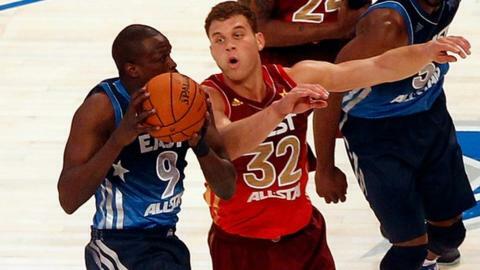 Luol Deng risked a fine for wearing an Africa T-shirt and was then injured as he became the first Briton to play in the NBA's annual All-Star Game. The Chicago Bulls star, whose Eastern Conference side lost 152-149 to the West in Florida, featured for less than six minutes before injuring his wrist. He also faces being fined by the NBA for wearing a T-shirt showing a map of the African continent. "If I get fined, I'm okay. It was what I felt like doing," said Deng. His action was not sanctioned by the NBA, but he insisted: "To me, what I did is worth it for me. It was a positive message as there's a lot of negativity going on in the continent of Africa. I think if my parents saw it they would be very proud." During the match, Deng was one of only three players not to score a point. The Chicago Bulls forward missed both his field-goal attempts but had one assist in his five minutes and 51 seconds on court. A heavy fall then prompted concerns for his left wrist, which has been a long-term injury concern. "It was nothing," said Deng. "I fell on my wrist and I felt it. The coach said 'are you alright?' and I said 'I'm fine' but the plan was to play six minutes in that quarter. "Then in the second half he asked me, and I just said if we could go without it and rest it. He had a lot of options. "The NBA take a dim view on players doing their own thing. It wasn't a sanctioned move by the NBA and as such he could face a hefty fine"
"It's going to happen, there's no way I'm going the rest of the season without falling. It's just something I accept and you've just got to deal with it." However, Deng added: "I really enjoyed the experience and the time out there. "It's a great honour but I've always believed I am good enough to be an All-Star. For me, being selected and recognised as an All-Star meant a lot more to me than what I was going to show or do tonight on the floor." The 26-year-old, originally from what is now South Sudan, is in his eighth season with the Bulls and was picked following a poll of the league's coaches.